 We have a goal of raising $8,000 per month for missions support.  Is it possible to do what God has called His Church to do?  Yes! But the cost will be tremendous, in Money, Resources, and People. The Apostle Paul demonstrated how to Pray, Give, Go. It doesn’t matter how much you have. What matters is how much you are willing to give from what you have.  Paul was so moved by their love and willing hearts that he taught every church he formed to establish this same kind of missionary giving. …and everyone who was willing and whose heart moved them came and brought an offering to the Lord for the work on the tent of meeting, for all its service, and for the sacred garments. …The people are bringing more than enough for doing the work the Lord commanded to be done….  The grace Paul talked about is the grace of giving.  Paul and his companions were just waiting to travel and proclaim the fame and the glory of God.  And what were they waiting on?  They were waiting on these people to grow in their faith so they would finance their mission endeavors. Faith comes from hearing and hearing by the word of God. We are in our missions emphasis series with a goal of raising $8,000 per month for missions support. Today we will collect the faith promise cards for missions giving over the next 12 months. 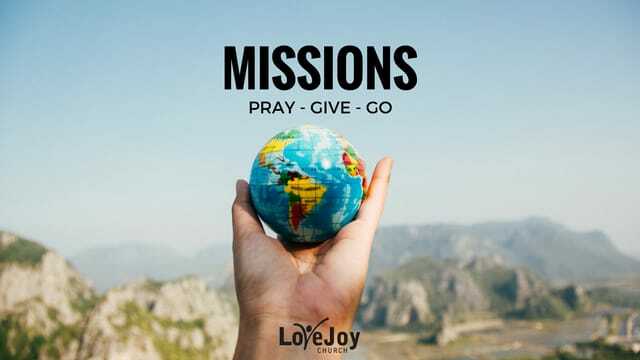 Our next missions offering will be on May 21 and then every month on the 3rd Sunday. To celebrate missions at Love Joy, everyone is invited to our annual ‘Taste of Nations’ lunch. Our members have brought in finger food to share from their ethnic background. Enjoy. Ladies you are invited to the W2W Annual Spring Luncheon on Saturday, May 13th at Salvatore's Italian Gardens, 6461 Transit Rd, Depew, NY 14043. Enjoy a delicious buffet lunch at this premier fine dining restaurant. Bring your loved ones. Lunch will be served at 12 noon. Tickets must be pre-purchased in the lobby. $23 adult buffet, Child’s meals have been reduced to $11 per child. Come and celebrate Jonathan Burgio's Official Ordination at our First Wednesday service, June 7 from 7pm to 8:30pm. Dessert & Coffee reception to follow.